Don Peyote’s promotional art comes adorned with pot leaves, but take the title at face value: This is aspirational psychedelia, bad-trip division. In practice, Dan Fogler’s sophomore directorial effort (co-directed/written by Michael Canzoniero) is merely execrable, segueing incoherently from one stand-alone fragment of a terrible movie to another. “Everything” in this case is meant in the Alex Jones sense: “False flag” operations, the Bilderbergs, the Illuminati, and all the other usual suspects of the American conspiracy-theorist landscape get at least a passing mention. Warren starts assembling a documentary in which he interviews the paranoid about the apocalypse and 2012’s then-imminent approach. For a while, Don Peyote appears to basically be that movie-within-a-movie, as Fogler hangs out with real fringe types like Freeman, who shows “Warren” an engraving on the Freemason Grand Lodge that (of course) predicts 9/11. Providing this kind of platform is unsavory in its own right, but as Warren goes off the deep end, cult-movie aspirations render the movie unwatchable in its own quasi-original way. 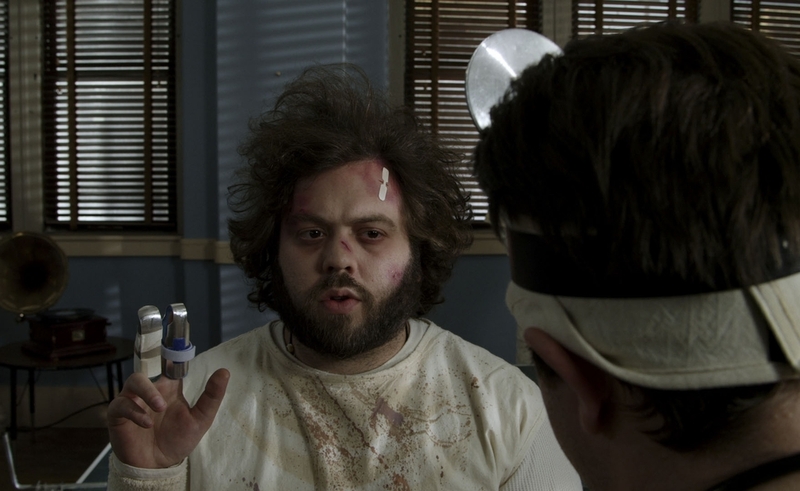 Fogler is admittedly an acquired taste: The title of his first directorial effort, Hysterical Psycho, pretty much describes his comic style—lots of screaming and falling, very little downtime. A mental breakdown/excessively sloppy musical number in which multiple headdress-wearing Foglers dance in the desert could only be followed by institutionalization, but that’s just the halfway point: Mental breakdowns are not the end. Timothy “Speed” Levitch shows up in the closet smoking a bong, delivers some of his usual motor-mouthed rants about society, and then Fogler breaks out, transitioning from one hallucinatory place where he can shriek to another. Someone’s favors certainly got called in for Don Peyote, since the cameo cast is stacked throughout—not just Hathaway and Levitch, but eccentric additions like Abel Ferrara as a cabbie. No outsider presences help: A climactic ayahuasca trip is a purgative for Warren, but this film is thoroughly alienating as the experience of staying sober while watching someone else trip hard. There’s no rhythm or rules, and the beyond-indifferent camerawork and community-access-TV-grade effects help nothing. The desired effect is to have viewers’ jaws drop at the insanity of it all, but that isn’t a practical outcome when the boorish sum of things thrown at the camera is scream/trip/repeat. Fogler at one point cuts away to his fictional agent, watching in disapproval: “He wrote it, so it’s no one’s fault but his own.” It’s a fitting verdict for this witless dump of aspirant craziness without a guiding intellect or vision.